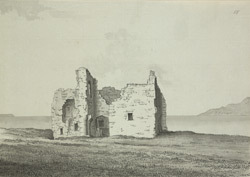 A north view in ink of Sandsfoot Castle near Weymouth in Dorset, showing the gateway. Henry VIII built this castle in the 1530s, when his defection from Roman Catholicism and subsequent divorce from Catherine of Aragon angered the Catholic powers of Spain and France. Along with the neighbouring Portland Castle, it was designed and situated as a buffer against invasion, protecting Portland Harbour and key roads inland. It was abandoned in the 17th century, when coastal erosion began to seriously damage the cliff-face. Portions of the castle itself crumbled into the sea. This erosion was retarded somewhat by the construction of the Portland Breakwater in 1849, but it remains a dangerously unstable structure with no public access.